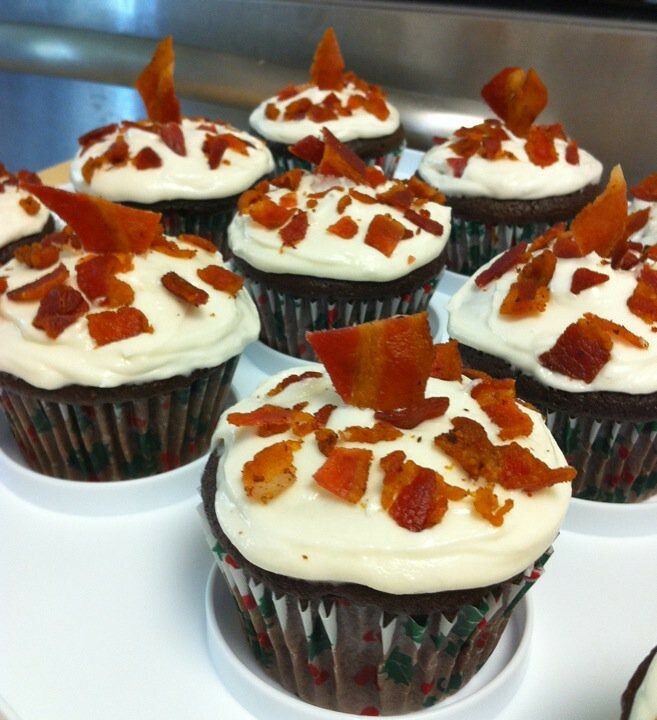 Want free chcoolate stout cupcakes with rum buttercream and bacon sprinkles? Come to our Honolulu cupcake meetup tonight! I'm very excited that Annie Cakes Hawaii (who can be reached at anniecakeshawaii at gmail.com and I'll have more about later this week) is making these chocolate stout cupcakes with rum buttercream & bacon sprinkles for our Honolulu cupcake meetup tonight! I'll be posting more about our cupcake spnsors today and this wee, but I hope you can join us. It's free and tonight and at the wonderful Greenhouse Innovation Hub, and I'm going to talk for a little while about how Cupcakes Take the Came came to be and then we are going to mingle and feast on cupcakes! 6-9 pm, Tuesday, January 31st, The Greenhouse Innovation Hub, 685 Auahi Street, Kaka'ako (808-285-3363). No need to RSVP, but you want to spread the word to your friends, here's the Facebook event page. We'll have many dozen cupcakes to enjoy! And if you're a tech type looking for a place to cowork, check out The Greenhouse, and if you live or are visiting Honolulu, check them out for amazing events each week (follow @HiGreenHouse on Twitter).